Over the weekend, my wife and I attended a wedding in Philadelphia, Pennsylvania. Although I've been there dozens of times, this was the first time I checked out the historic sites. What does this have to do with employment law? 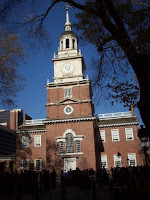 Well, the Declaration of Independence was approved and signed there in Independence Hall (see my photo top left) in 1776. The Declaration includes the right to the "pursuit of happiness" which I dubbed America's First Employment Law. Though in retrospect, perhaps the "United States' First Employment Law" would be more accurate. The Constitution was also "born" there in 1787. And, as we all know, the Constitution is the "supreme law of the land." U.S. Const. Art. VI cl. 2. To see more pictures (24 photos) from our tour of Philadelphia's historic sites, check out the Lawffice Space Facebook Fan Page.